There is a ‘big’ high tide and I decide to go for a walk at Cley. Driving past the quay at Wells I see the environment agency people out in full force and so decide to drive down to the quay at Blakeney on the way, just to have a look. A strong northerly wind is pushing the water higher than it is supposed to go, and the water is lapping over Blakeney quay. 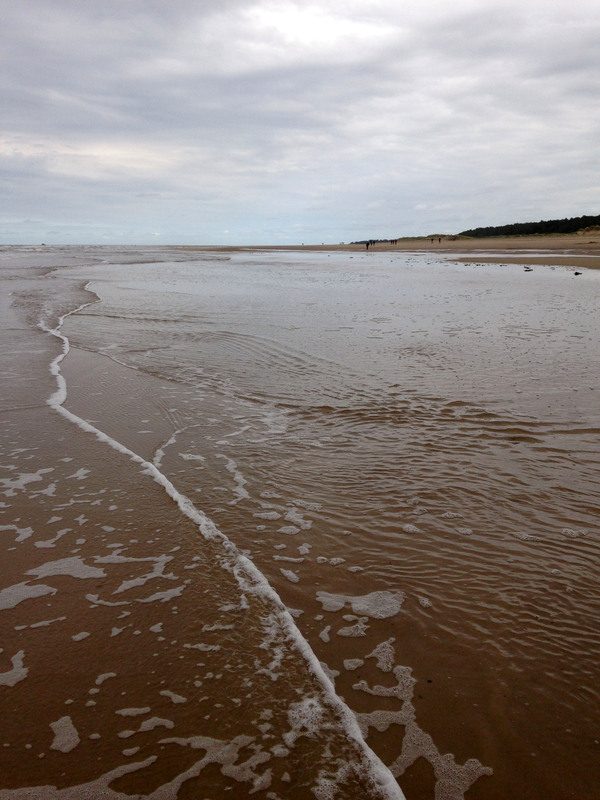 When the wind pushes the tide in like this it becomes obvious why tall, sturdy poles line its edge. The boats strain their moorings as they level with the top of the quay and are pushed up against the restraining posts by the wind and the water; without these poles the boats would be grounded, high and dry, as the water ebbs away. I carry on to Cley and driving down the road to the beach I can see enormous waves topping the shingle bank – it is going to be a dramatic sight. The car park just behind the beach is full of water; the sea seems to be seeping through the shingle and filling the lower ground. Out of the car I’m hit by the full force of the wind and quickly realise that a walk along the beach would be potentially dangerous as huge waves are crashing high up the beach, higher than I have ever seen them go before. In places they top the bank and surge down the other side onto the marsh. 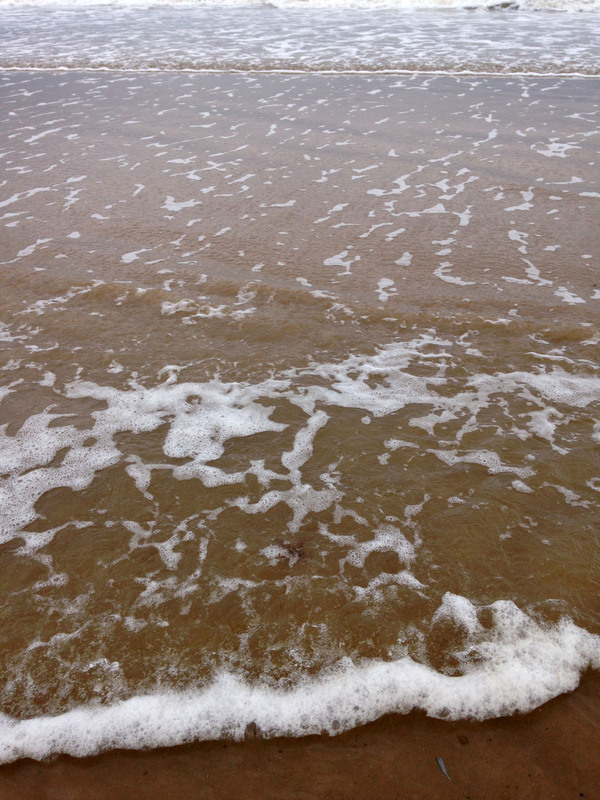 As I stand and watch, other people appear, and also stand mesmerised by the boiling sea. They have cameras and take photos but I have nothing to record the scene with. Instead I just look. Spray is blown high into the sky by the wind as the waves peak and then crash down. The sound is deafening: a loud, thundering roar that resonates deep inside you and the rasping, scrape of stones as they are pulled by the back draft. Seagulls are swooping low, flying just above the waves. They seem to be playing dare, as every now and then one flies below a breaking crest into the seething belly of the wave, before rising up again to glide, unconcerned, above the foaming water. It’s hard to describe the power and insistence of the sea, but when I get home I do some drawings to try and capture its movement …. I think they are rather too tame! This entry was posted in drawing, listening, looking, noticing, painting, walking, watercolour, weather and tagged beach, landscape, waves, weather, wind on January 4, 2017 by debbielyddon. I am wrestling with making work at the moment – too many ideas means that I can’t settle comfortably to one thing. I jump around from one idea to the next, not really sure whether things are working or not. It’s a state I’ve been in before – I just have to keep going and remember wise words that I read somewhere (sorry I can’t remember where) and that is that if you know what you are doing you are not being creative. Walking always helps – often ideas occur to me or connections are made as I walk myself into a meditative state. However, even though sometimes there is revelation, more often than not there is silence. 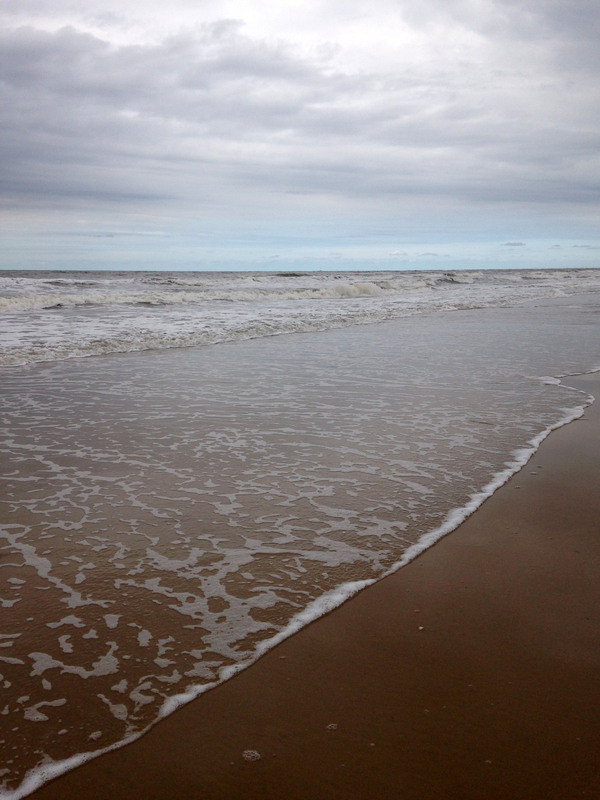 A couple of days ago I went down to the beach in-between rainy showers for a much needed breath of fresh air. The tide was coming in. Watching it flood over the sand flats and fill the dips and hollows in an inexorable movement forward is mesmerising. I find I have the need to map its coming in – to measure its flow. A quick line made in the sand with my foot marks a spot a few metres back from the edge. 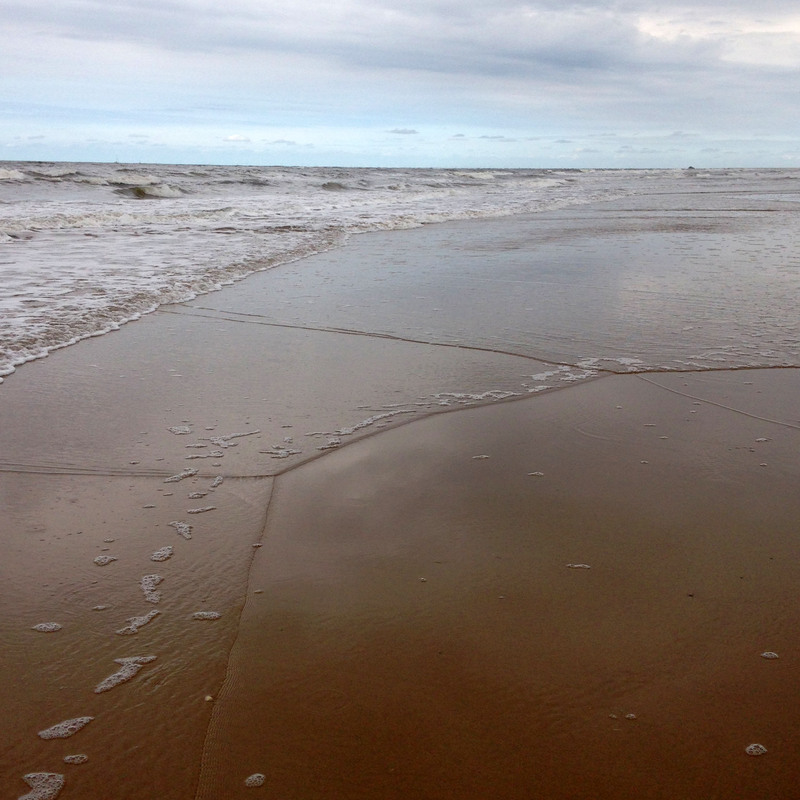 Waves ripple forwards in surges, back and forth, advancing and retreating, until the line is reached. It makes me think of my grandfather who always said that the seventh wave is bigger. I count the waves. This piece of folklore is not scientifically correct but there are occasional bigger waves and they seem to push the tide further in. Watching and counting the waves I start to notice. The more I look, the more I notice and the more I make connections to what I see and what I think. 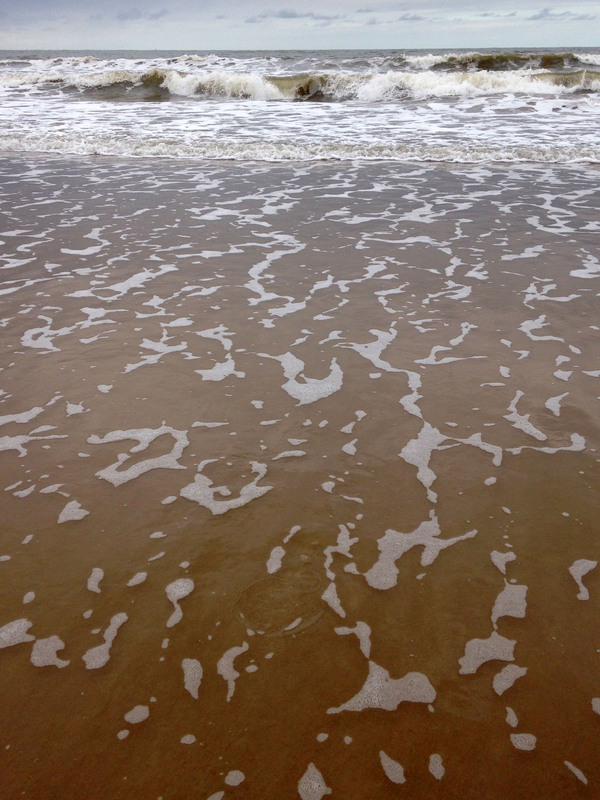 Crossing lines of foamy water relate to small line drawings I have been doing recently. Tiny bubbles make me think of a different way of making holes in cloth. A small shred of bladder wrack that floats in connects to some salt and sand pieces I have been making and suggests something new. A breath of fresh air has cleared my head and luckily this time I have found the impetus to go on. 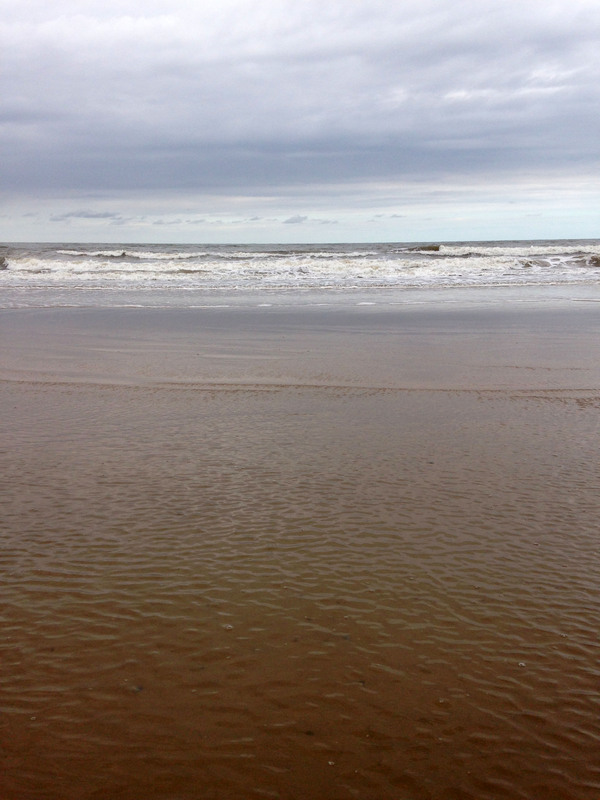 This entry was posted in counting, looking, mapping, noticing, thinking, walking and tagged beach, landscape, waves on August 1, 2015 by debbielyddon.